Luca Connell (right) in action against Bristol City for Bolton last weekend. IRISH U18 INTERNATIONAL Luca Connell made his full league debut for Bolton Wanderers tonight in a 1-1 draw with Reading. 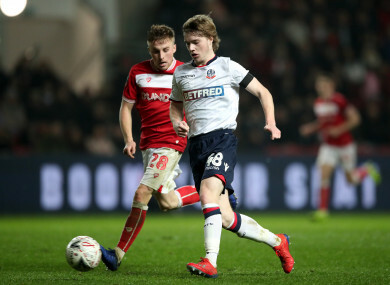 17-year-old Connell started Bolton’s 2-1 FA Cup defeat against Bristol City last weekend, and he played the first 72 minutes of this vital clash at the bottom of the Championship. Reading took a 74th-minute lead through Nelson Oliveira, but were undone by a last-minute equaliser by Jack Hobbs. The result leaves Bolton and Reading 23rd and 22nd in the table respectively; two and one point from safety respectively. Connell played the first 72 minutes of the game, before making way for Joe Pritchard. The midfielder was born in Liverpool and is eligible for England, but thus far has played at U17 and U18 level for Ireland. He is highly-rated beyond just Bolton, with reports in the English press today claiming he is subject to interest from Spurs, Southampton, Burnley and Brighton. Elsewhere in the Championship, Swansea City and Birmingham City weren’t separated after a thrilling, 3-3 draw at the Liberty Stadium. The Swans twice led, but needed a last-minute Oliver McBurnie goal to rescue a point. Email “Exciting Irish U18 international makes Championship debut amid links to Spurs ”. Feedback on “Exciting Irish U18 international makes Championship debut amid links to Spurs ”.